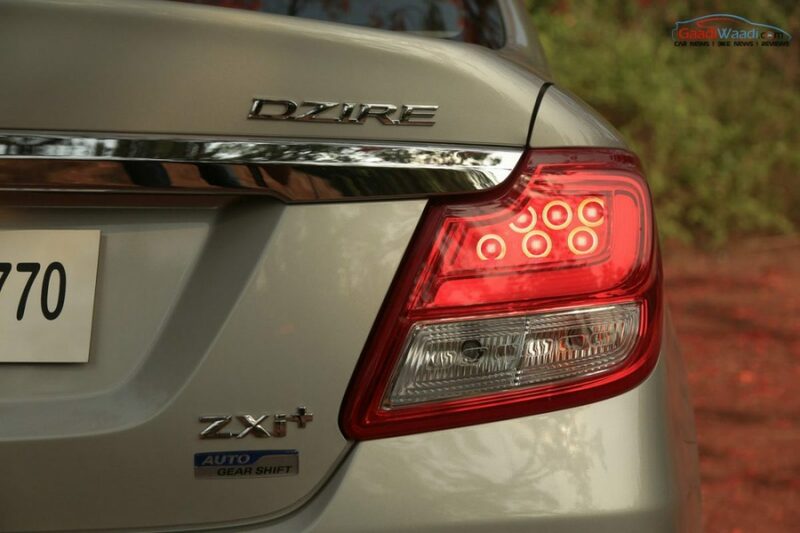 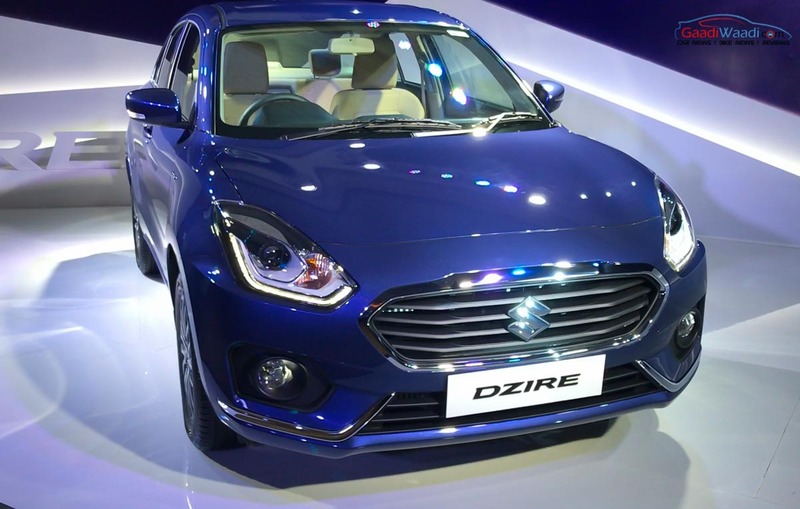 Maruti Suzuki Dzire is certainly one of the popular compact sedans in Indian market for a long time now. 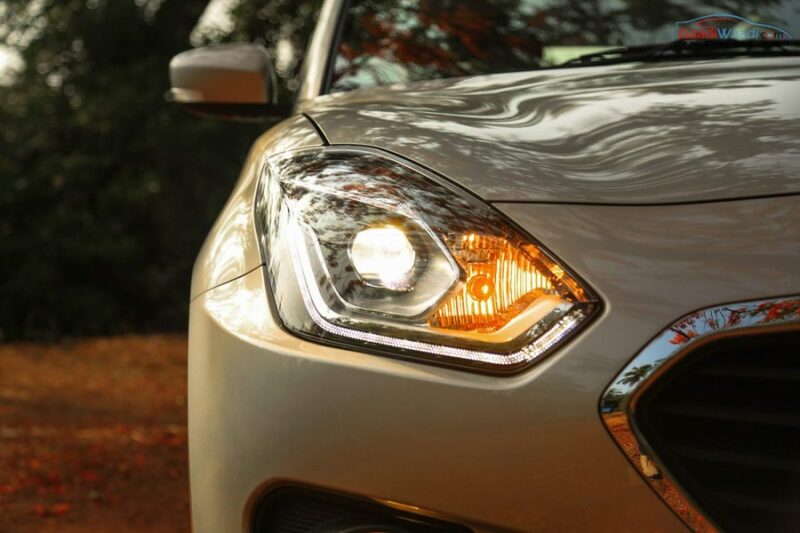 The car is based on the Indo-Japanese automaker’s highly successful hatchback, the Swift. 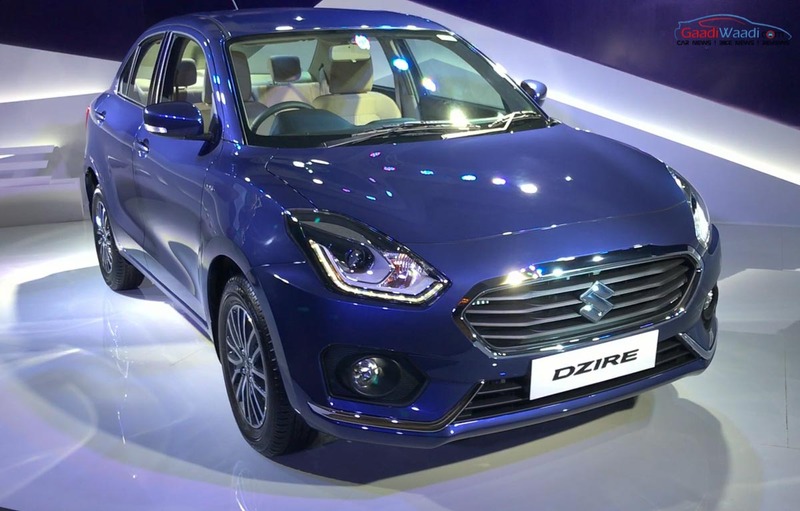 While Swift is preparing to be launched in its all-new avatar only next year, the re-named Dzire has arrived first following its official preview last month. 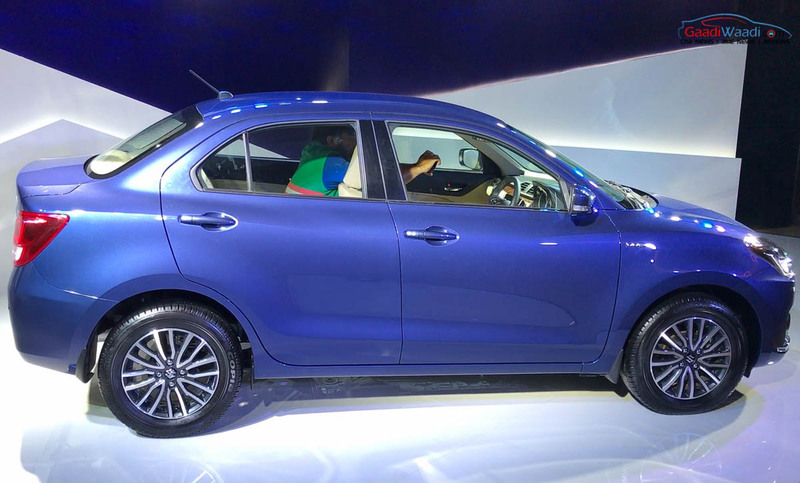 With a fresh pack of sharper design language, the new Dzire will be aiming to appeal for both personal as well as fleet operators through its life span. 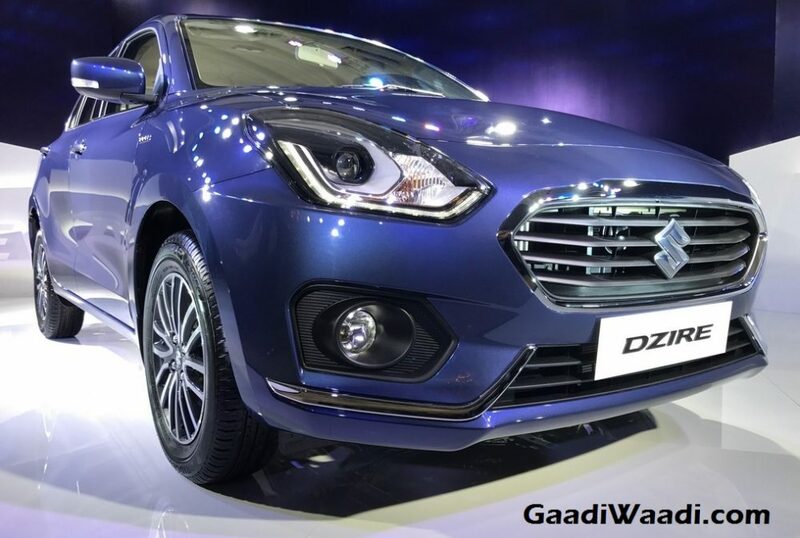 As the sub-four compact sedan segment is known for practicality and less-than-favourable good looks, the 2017 Dzire could re-write a new chapter with upmarket styling obtained from its hatchback cousin along with the efficient powertrain, spaciousness and practicality. 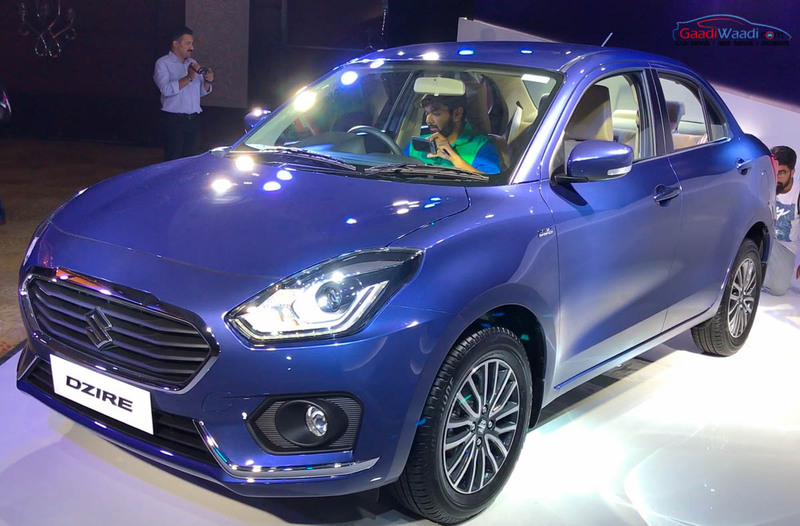 The all-new Dzire shares several design elements and components with the upcoming Swift besides the HEARTECT platform from Baleno that was said to be 15 percent lighter than its hatchback guise. 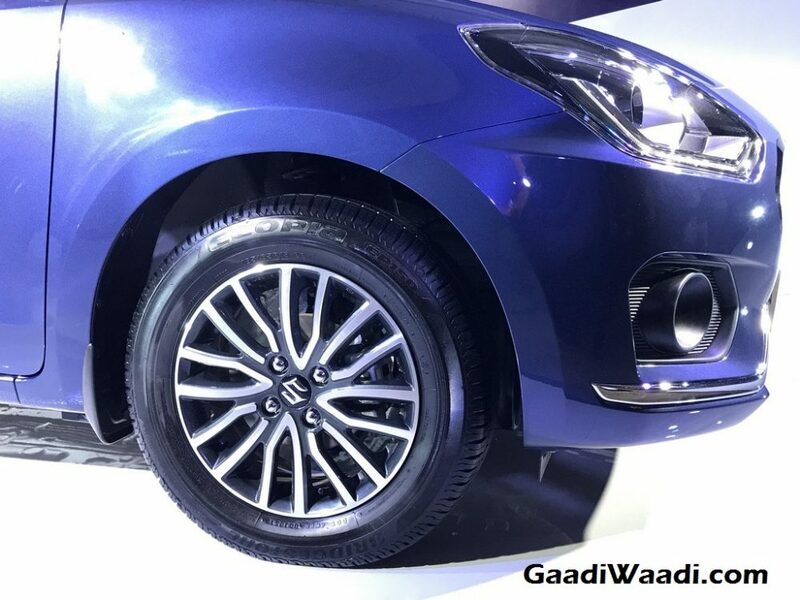 We brought you the first ever genuine spy pics of the new Swift Dzire before treating you with the undisguised shots of the production model. 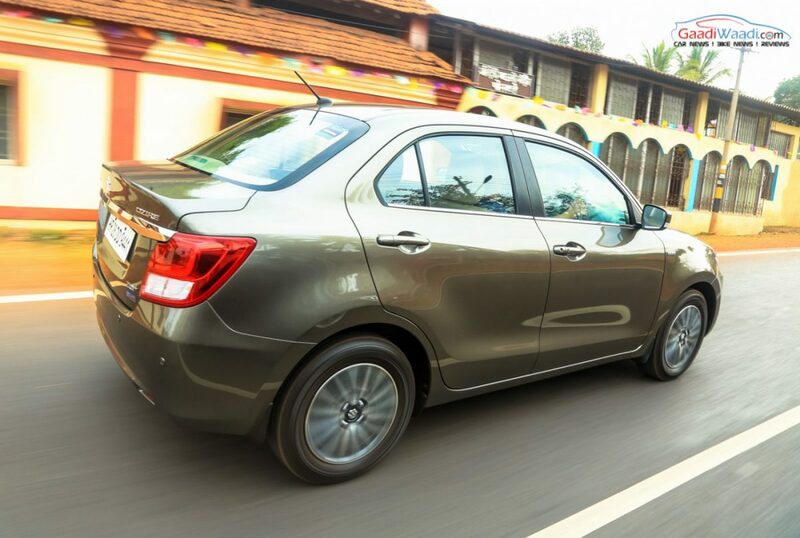 The leading car maker in the country has dropped the Swift badge from the subcompact sedan in pursuit of rendering it a unique identity within the product lineup and it seems to have worked very well so far with the soaring booking levels. 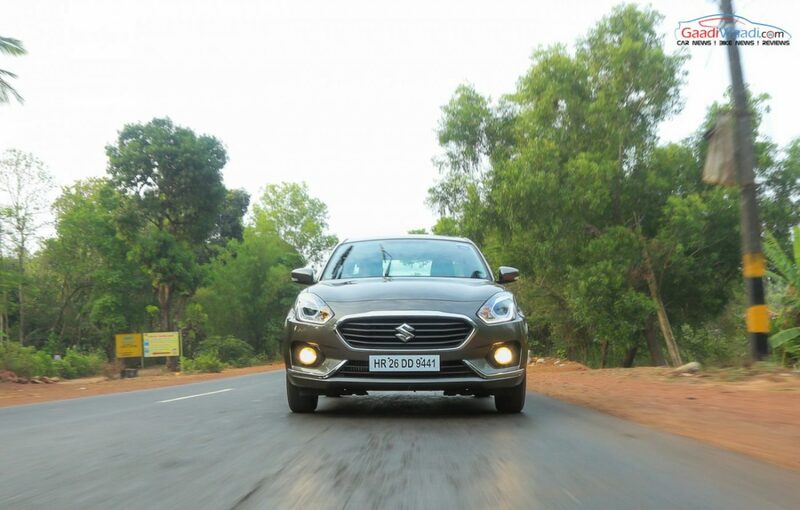 The Swift and the Dzire hold huge significance for the leading car maker in the country in terms of sales. 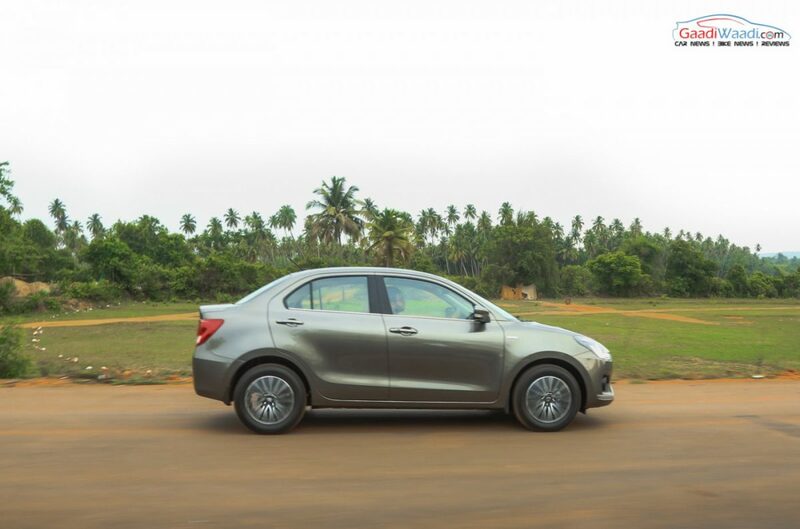 In fact, the Swift has more customers in India than the entire global markets combined by a large amount. 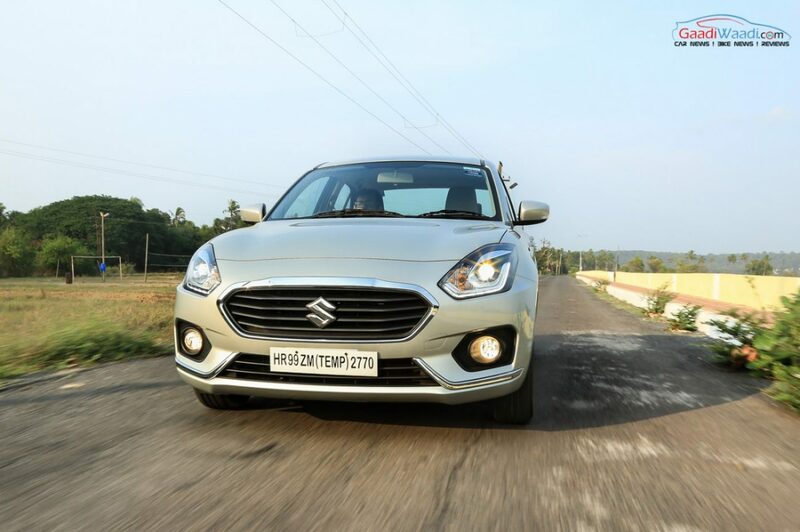 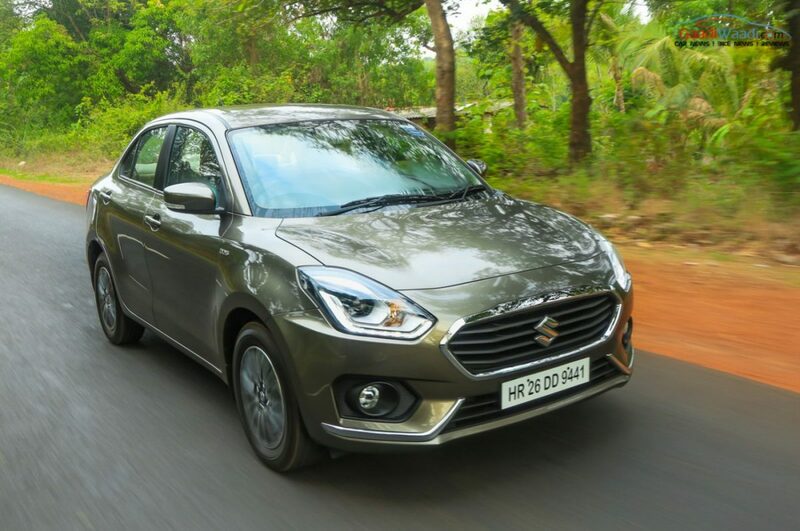 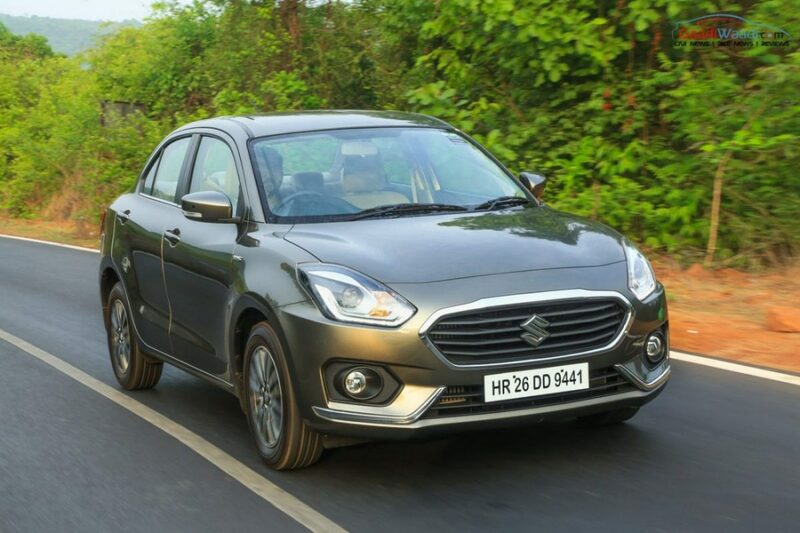 The Dzire took advantage of the sub-four metre category and is the first product that emerged with superlative sales numbers over the years in that particular space. 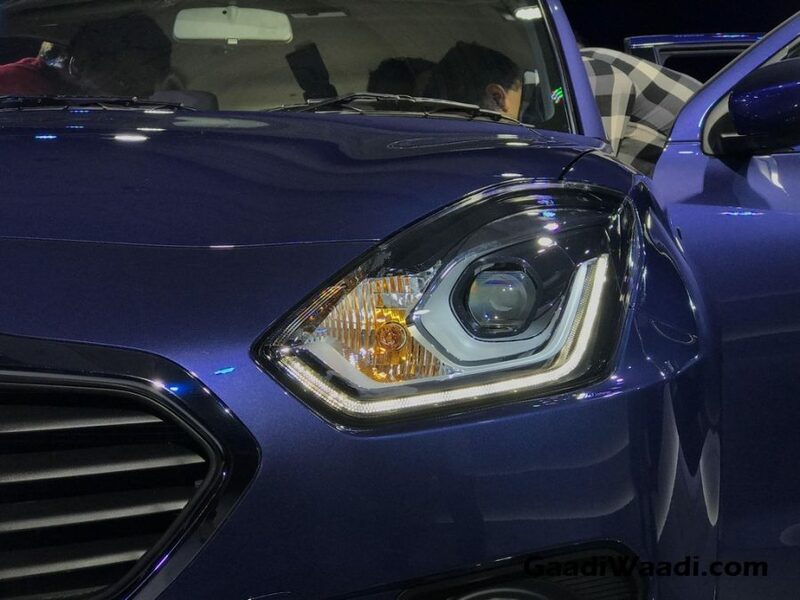 Therefore, the new generation versions of both these models will be looking to carry the torch with dignity from their predecessors. 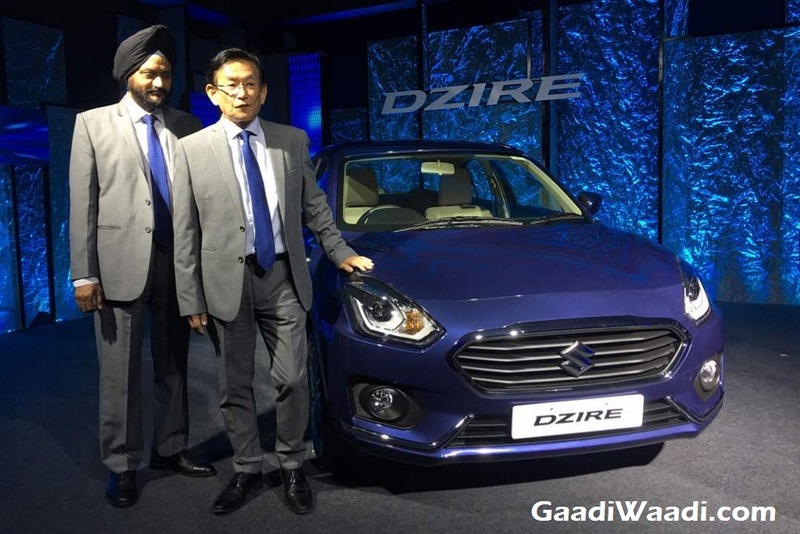 The all-new 2017 Maruti Suzuki Swift Dzire has finally been launched in India today after creating huge fanfare during its market unveiling last month. 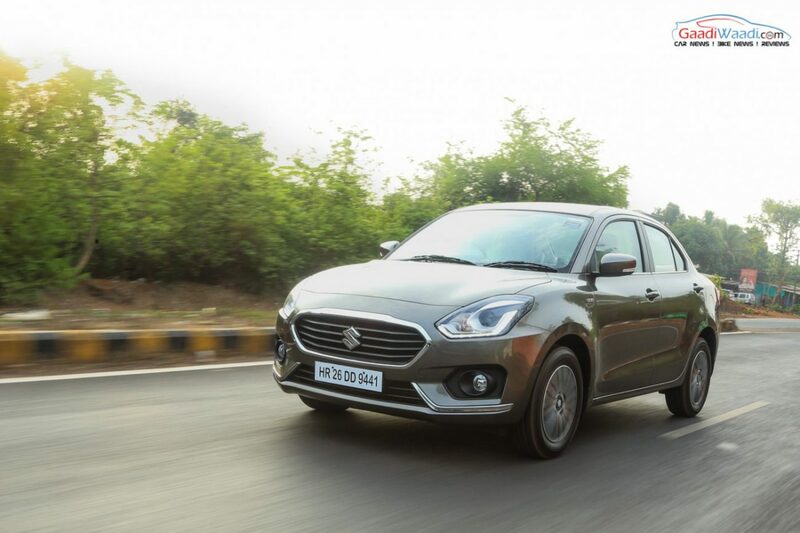 This means, it has arrived ahead of its hatchback sibling, as the new-generation Swift will reach showrooms only in late 2018. 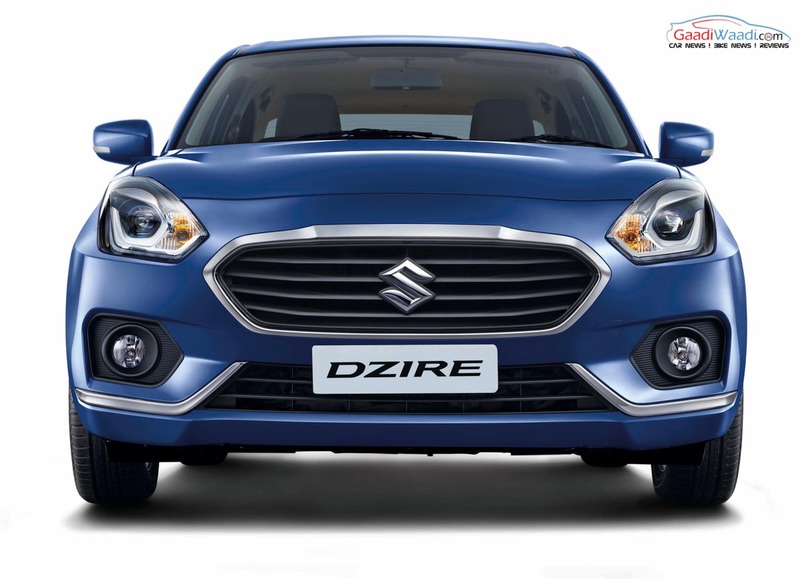 Launching first in 2008, the Dzire became the bestselling sedan in India in a very short time and now the latest generation has seen an investment of Rs. 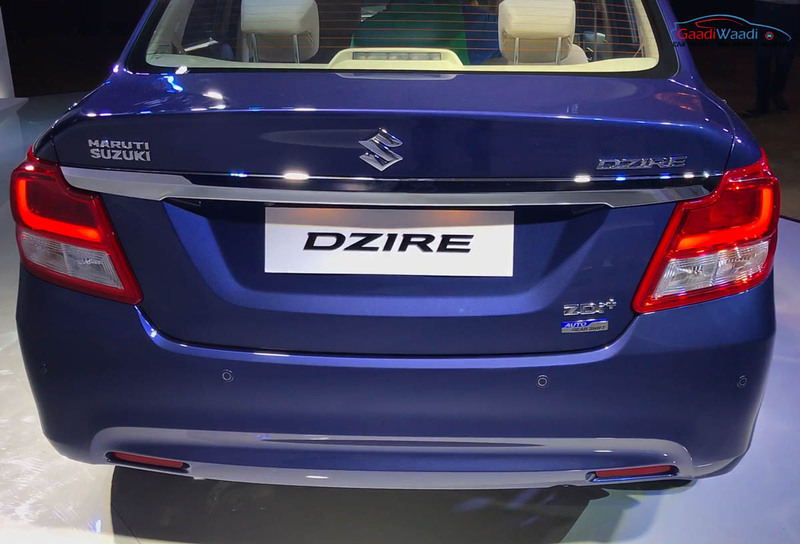 1,000 crore to achieve 99 percent localisation and to carry the momentum from its predecessor. 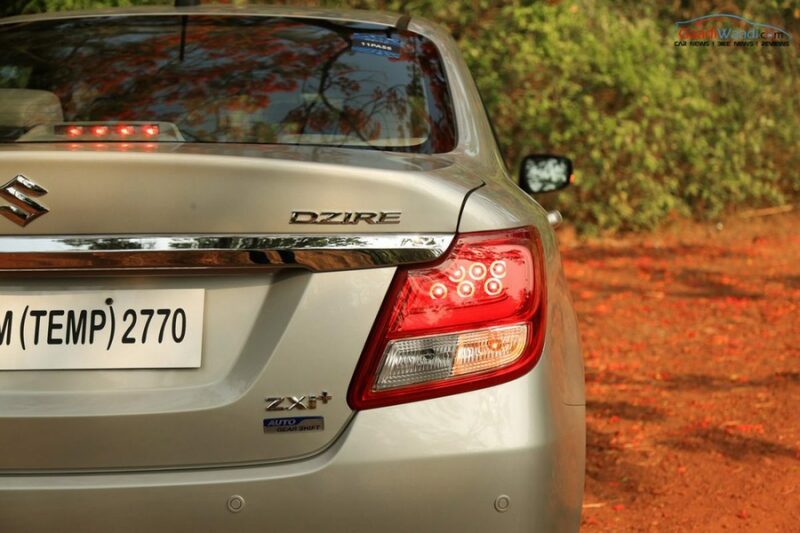 The outgoing Dzire in India was sold in 13 variants across two engine and as many transmission options. 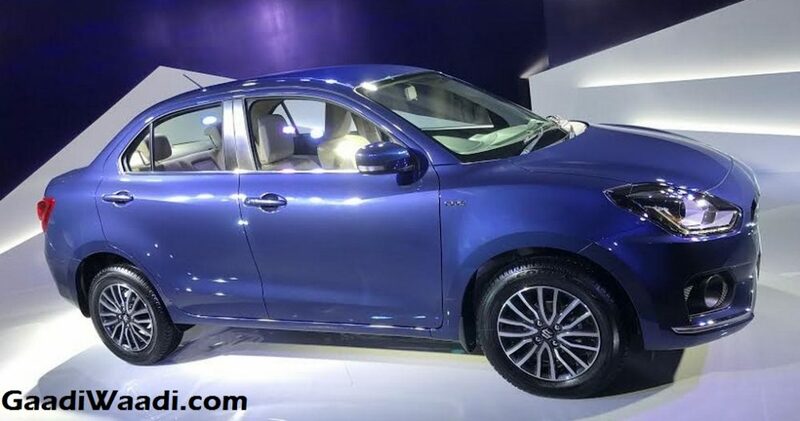 Prices started from Rs. 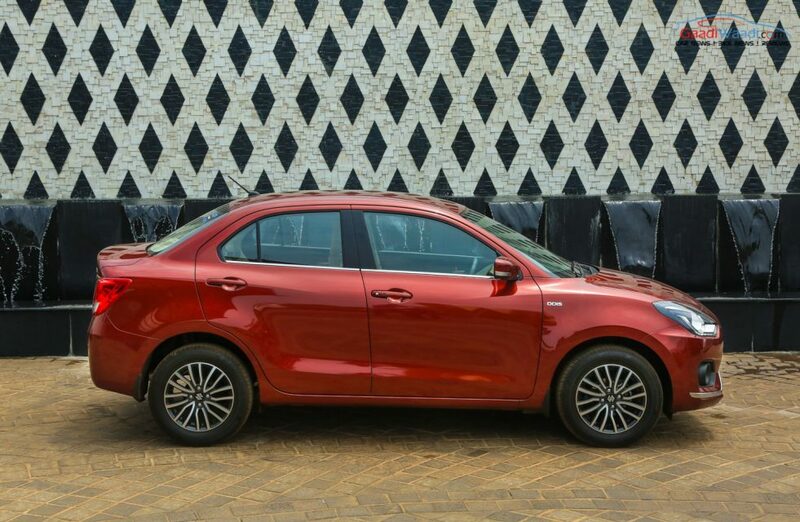 5.35 lakh for the entry-level LXI trim and it goes higher up to Rs. 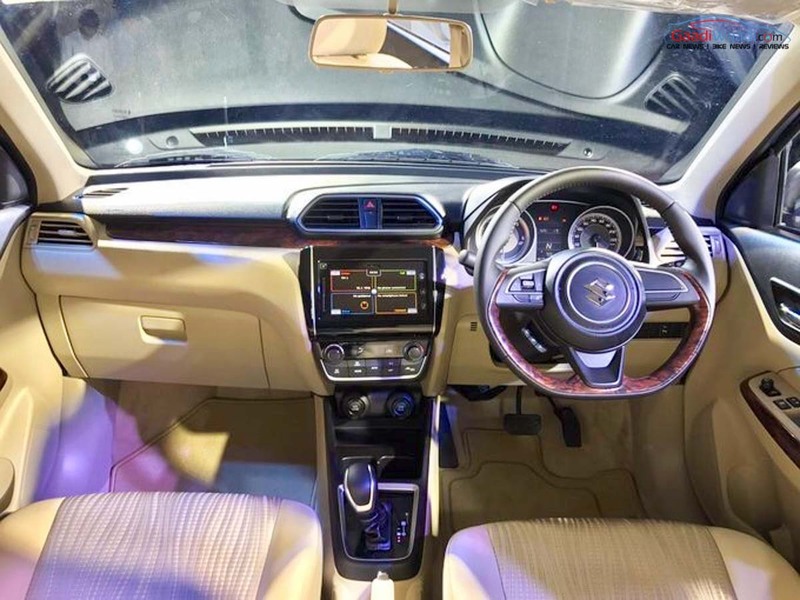 8.58 lakh for the range-topping ZDI AMT variant (both prices ex-showroom, New Delhi). 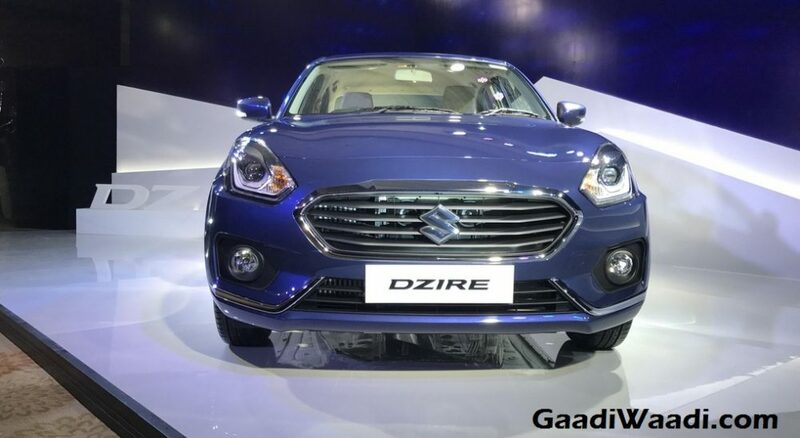 However, in the new-gen Dzire sedan, the entry-level model’s price has gone up only by Rs. 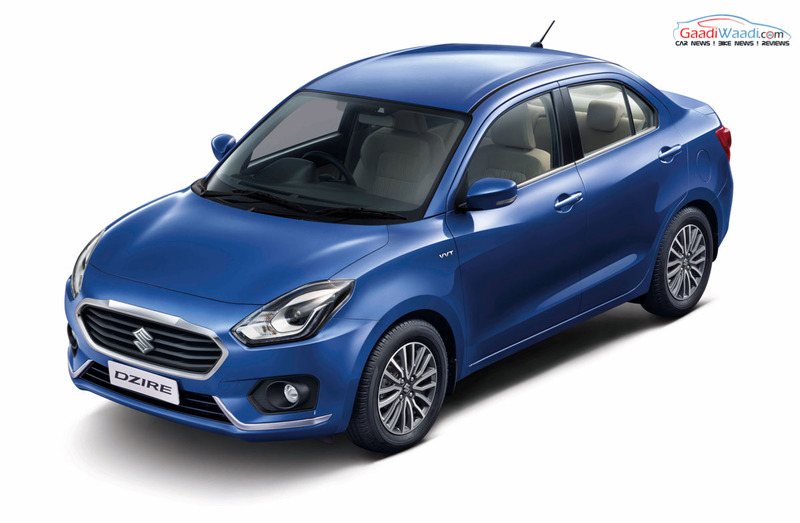 10,000 surprisingly as it’s now at Rs. 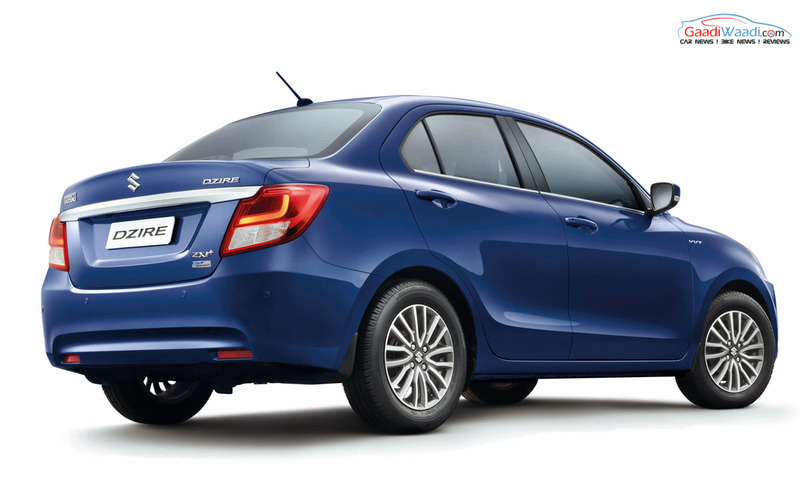 5.45 lakh but the diesel top-end’s cost has risen up to Rs. 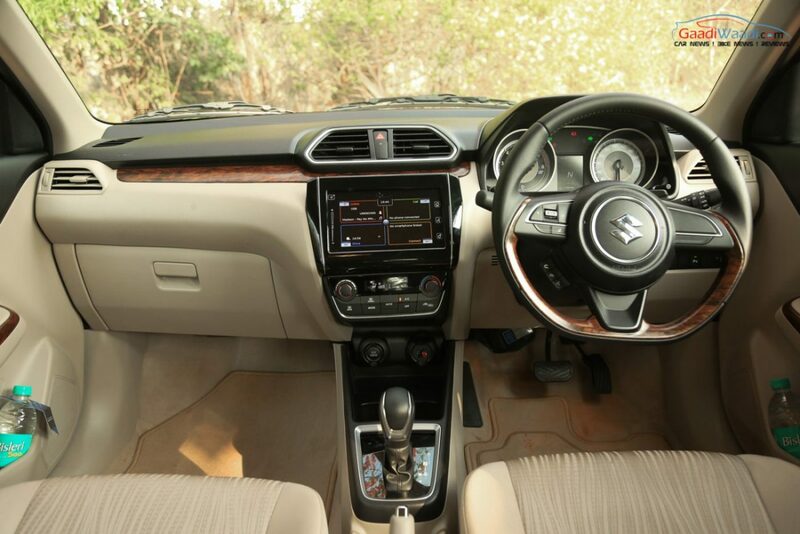 9.41 lakh (both ex-showroom, New Delhi) due to plenty of new features and safety technologies on offer. 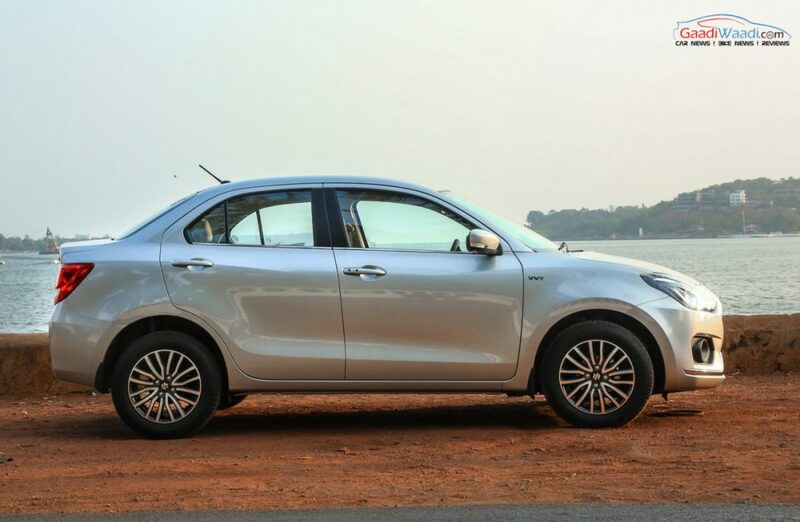 The proven 1.2-litre K-series petrol engine continues to produce a maximum power output of 83 bhp at 6,000 rpm and 113 Nm peak torque delivered at 4,000 rpm. 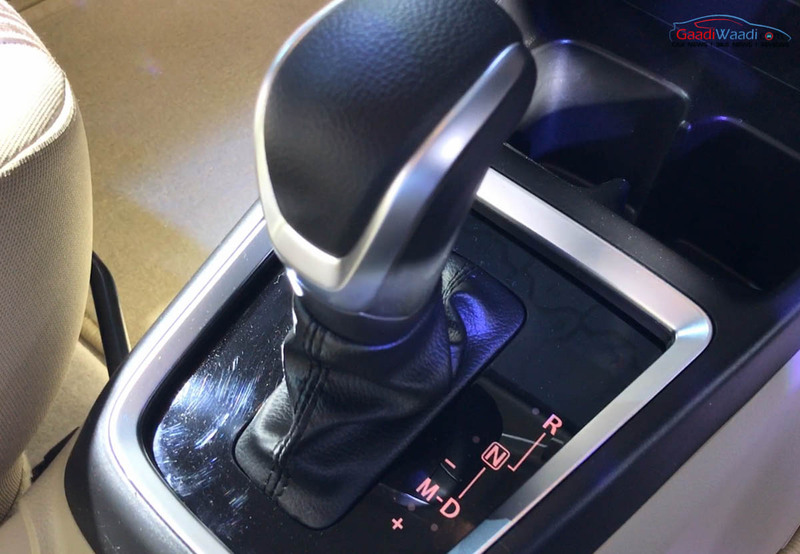 It is mated to either a five-speed manual as standard or a four-speed automatic that can be bought as an option. 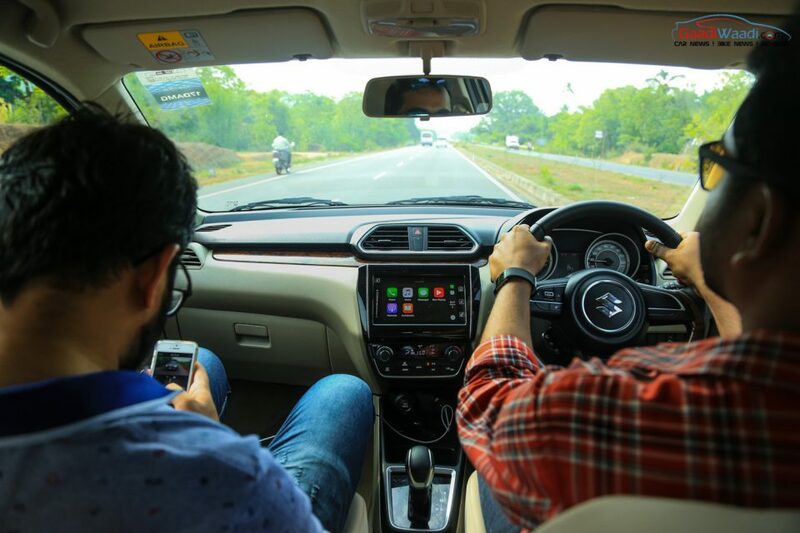 Sending power to the front wheels, the manual transmission is responsible for claimed fuel economy of 22 kmpl (as opposed to old 20.85 kmpl) while the AMT returns a same rated mileage of 22 kmpl (opposed to 18.50 kmpl of outgoing model). 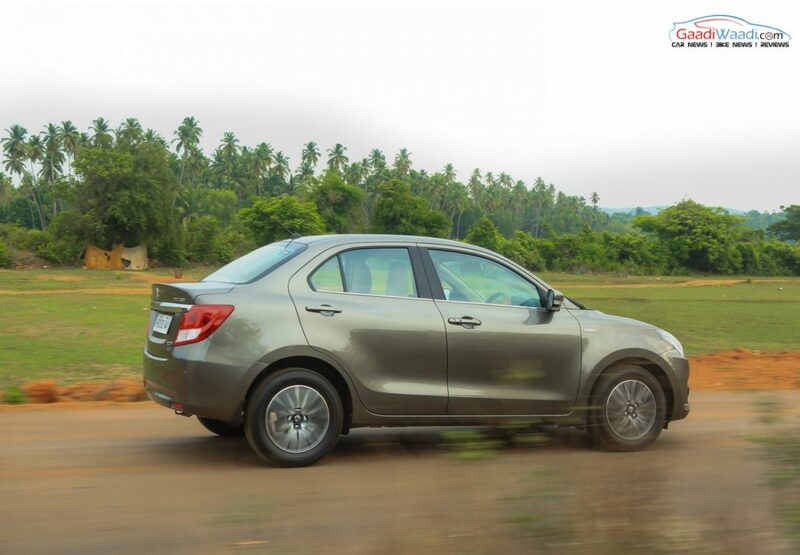 On the other hand, the reliable 1.3-litre DDiS diesel mill develops 74 bhp at 4,000 rpm and 190 Nm at 2,000 rpm. 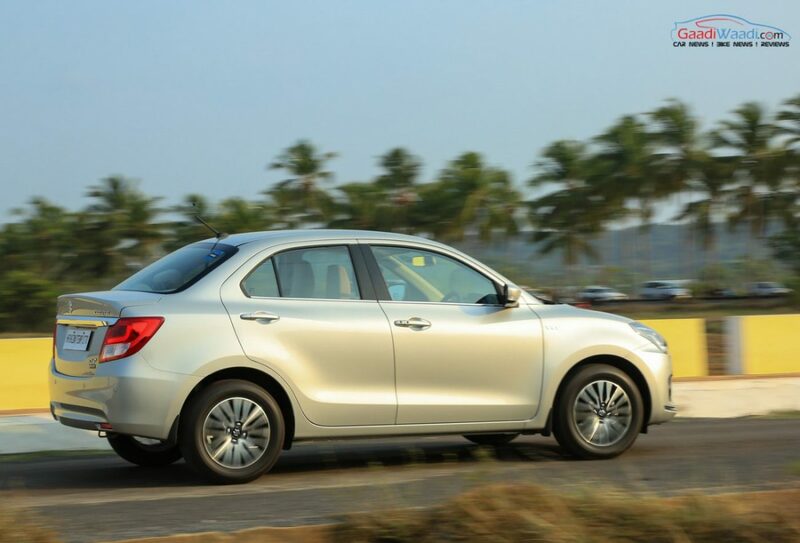 Driving the front wheels is through a five-speed manual or a five-speed AMT. 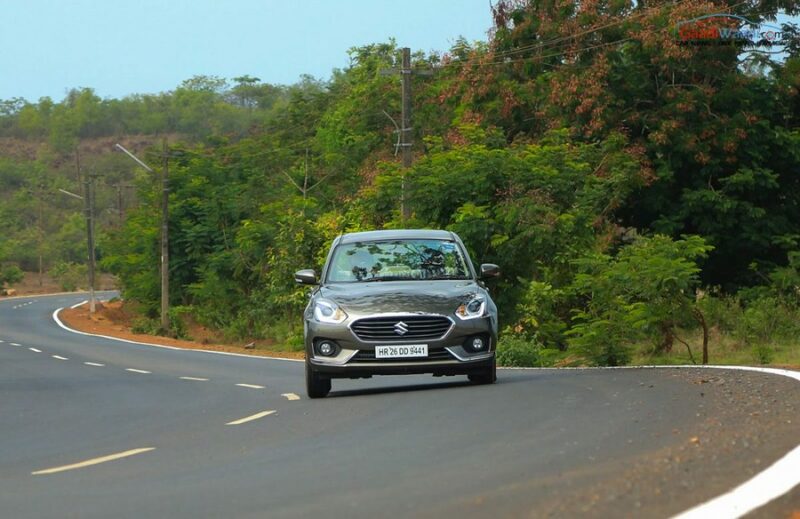 The ARAI certified fuel consumption stands in an identical manner at 28.4 kmpl (26.59 kmpl in old model) for both transmission options. 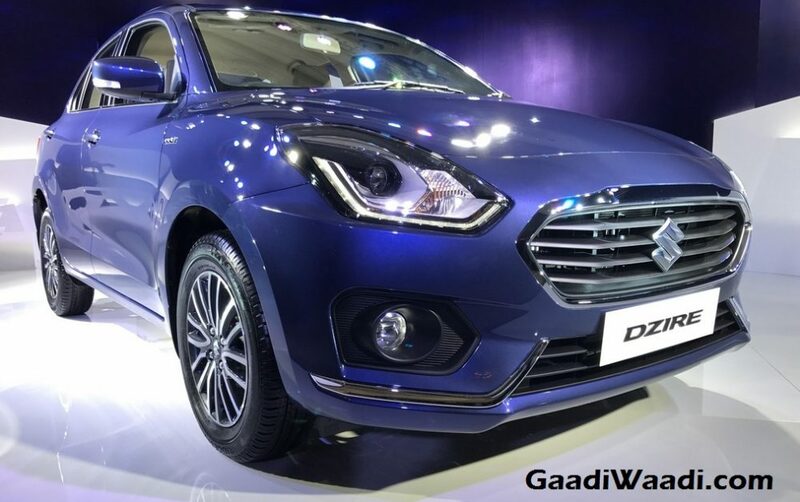 The AGS equipped Dzire will be sold from V variant. 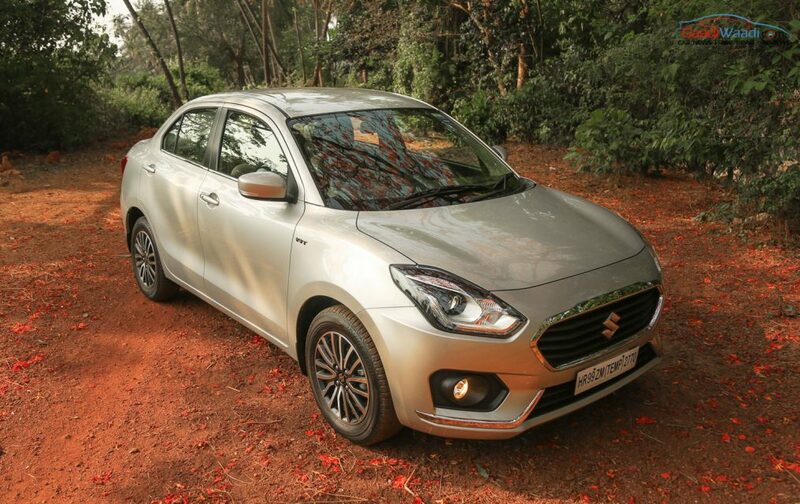 Also, a 1.0-litre Boosterjet turbocharged petrol engine is on the cards in a later time. 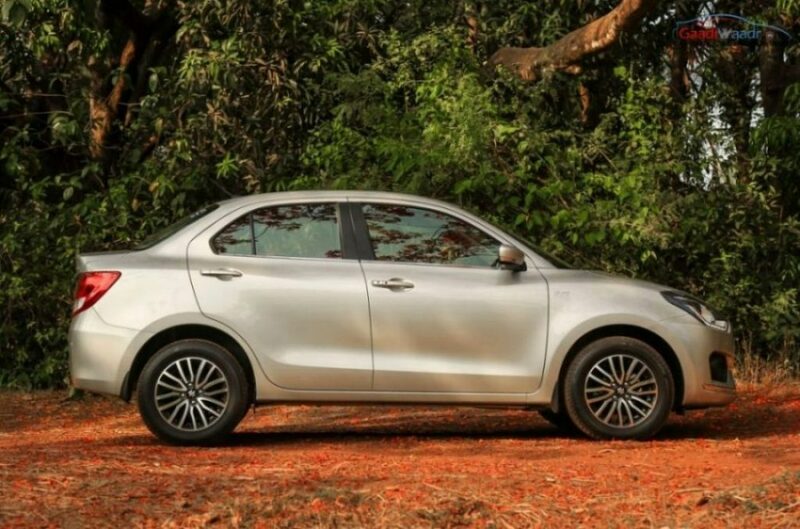 An in-house developed 1.5-litre diesel could replace the existing 1.3-litre Fiat-sourced Multijet engine in the near future. 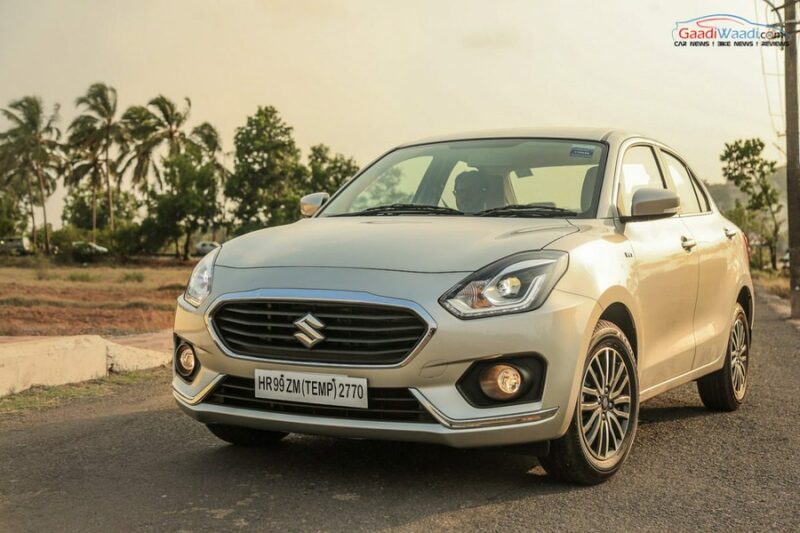 The brand new Maruti Swift Dzire should be capable of getting to a top speed close to 175 kmph for petrol MT and 170 kmph for the petrol automatic – slightly quicker than the outgoing model. 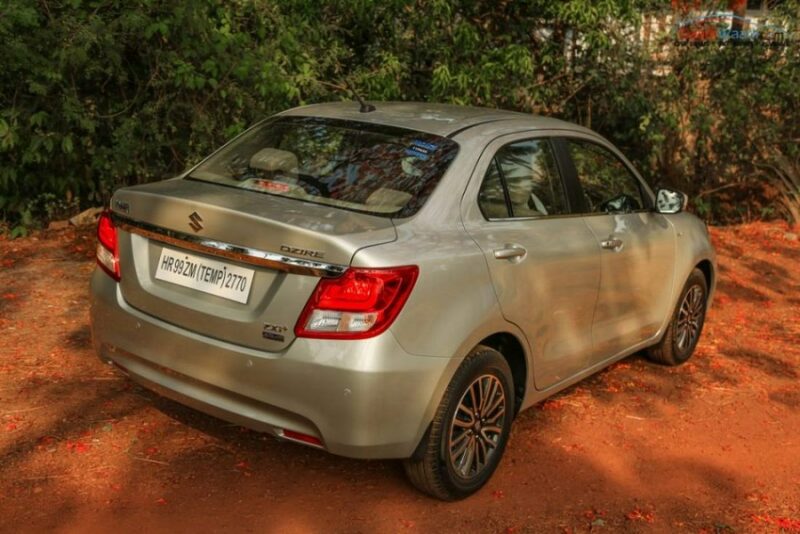 The former could be capable of doing 0-100 kmph in 11.7 seconds while the latter should get there in 13.2 seconds. 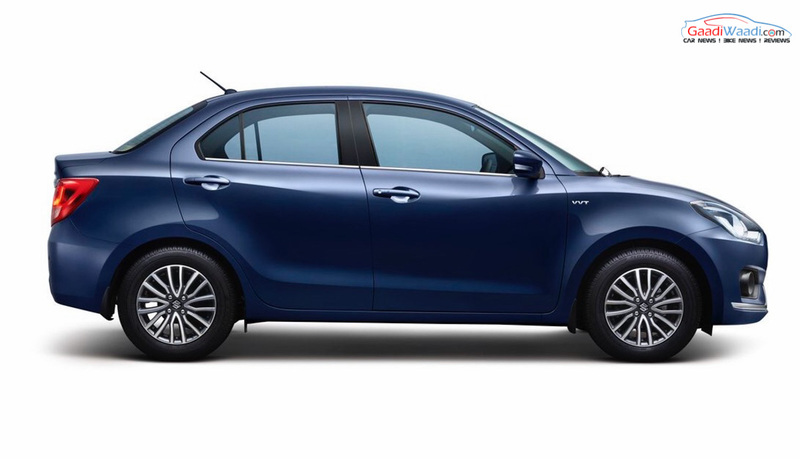 As the 2017 Maruti Suzuki Swift Dzire is based on a new lightweight platform of the Baleno, it comes around 100-kg lighter than the outgoing model. 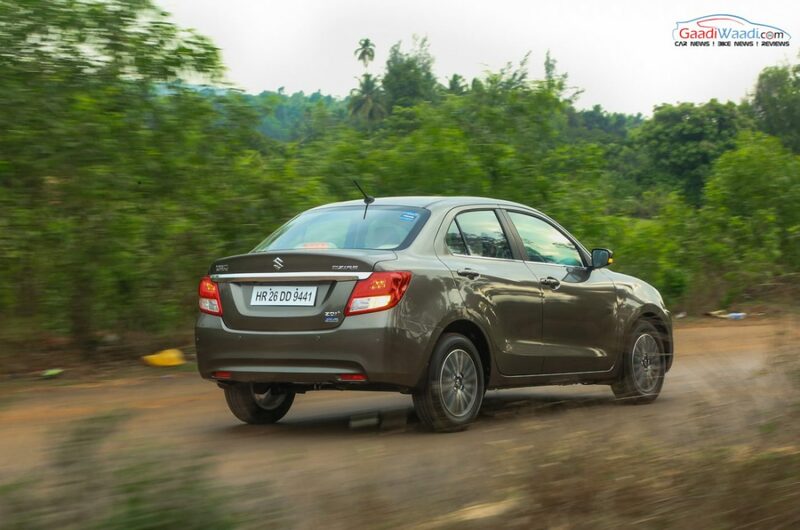 With this reduced weight, the compact sedan has become more fuel efficient than ever – so much so that it is the best in the segment. 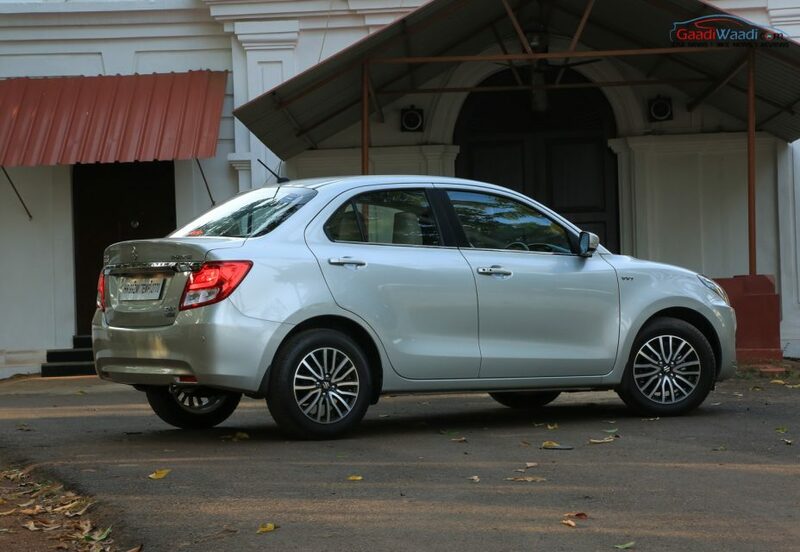 It to deliver a claimed fuel efficiency of 22 kmpl for petrol models while the diesel is claimed to return a massive 28.4 kmpl. 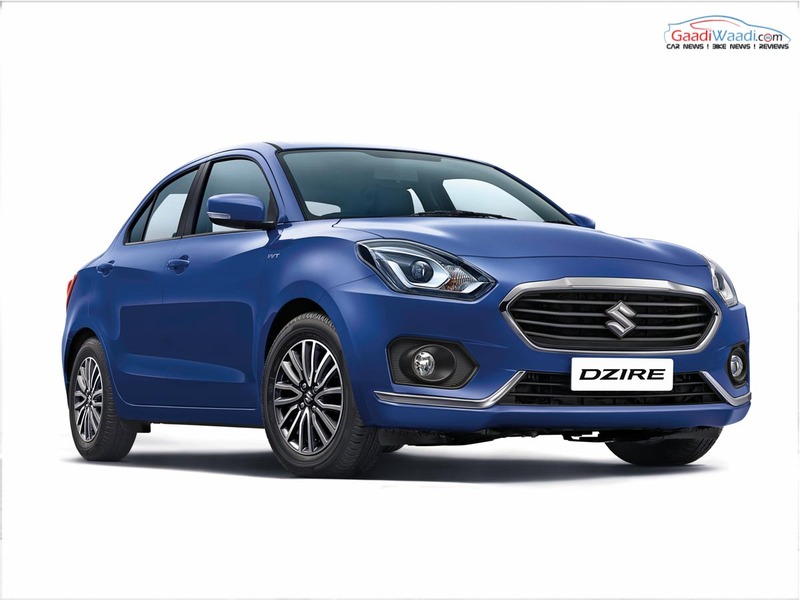 More emphasise has been put on the visual front, as the Dzire remained significantly unaltered ever since it entered the business. 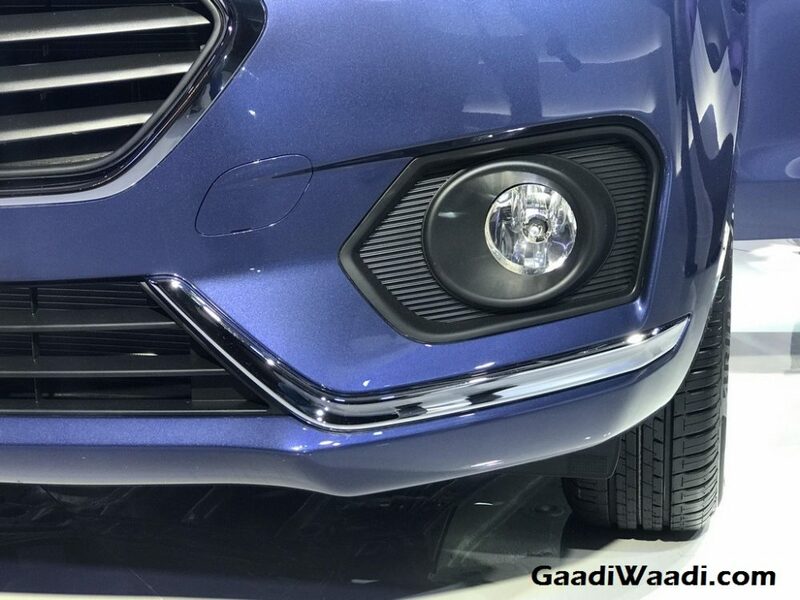 Standing in line with the new generation Swift hatchback that had already been revealed globally and will grace India sometime next year, the front fascia poses an aggressive and sleeker stance. 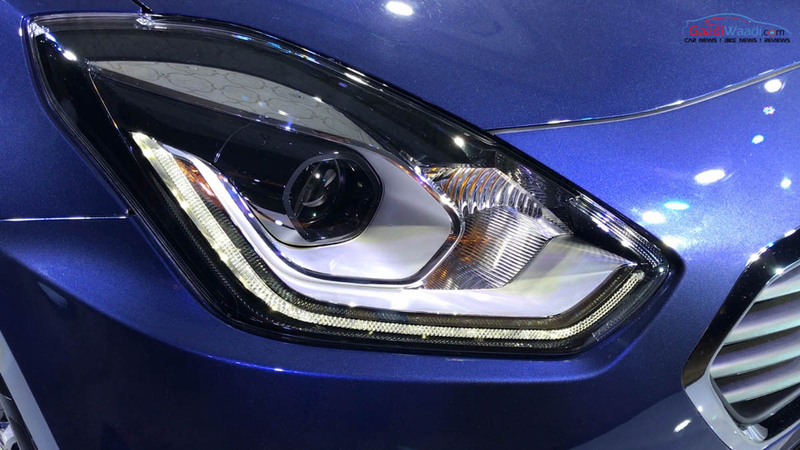 The projector headlights incorporating LED Daytime Running Lights are now sharper and will give a distinctive look compared to the outgoing model. 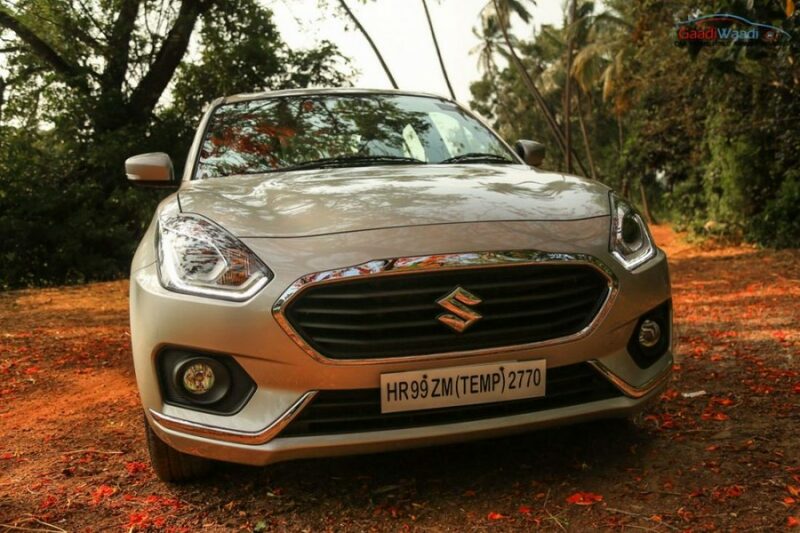 The front bumper has larger air intake at the lower portion while the fog lamp surrounds are much more appealing and sporty. 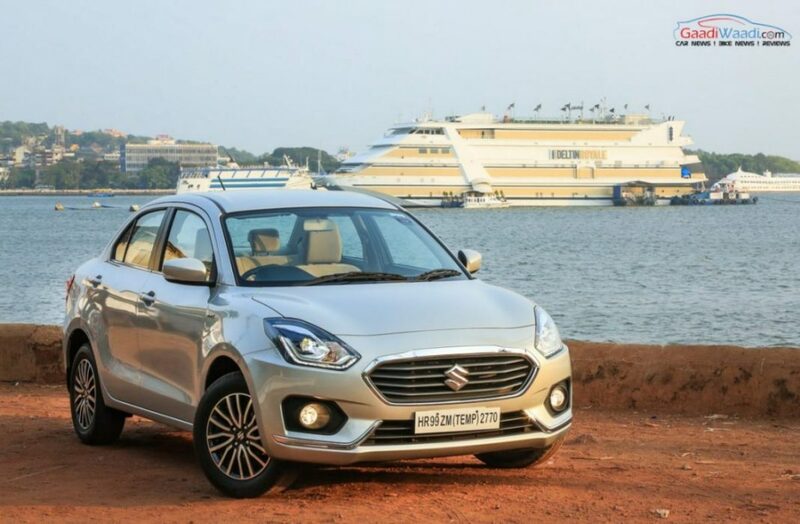 The high-end trims will have the newly designed polygonal chrome grille being treated with chrome amidst other design elements receiving the same touch for an upmarket appeal. 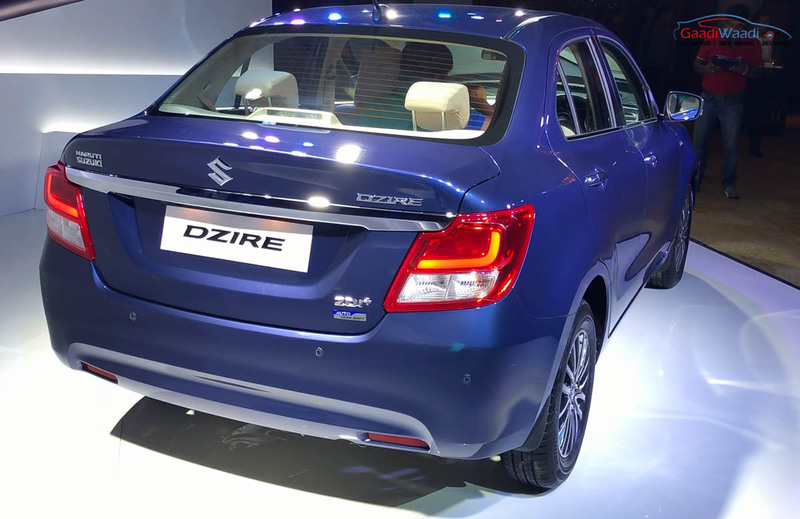 The Maruti Dzire will have its side profile heavily influenced by Baleno with more curvy A-pillar and sloped roofline elevating its overall stature along with two-tone alloy wheels. 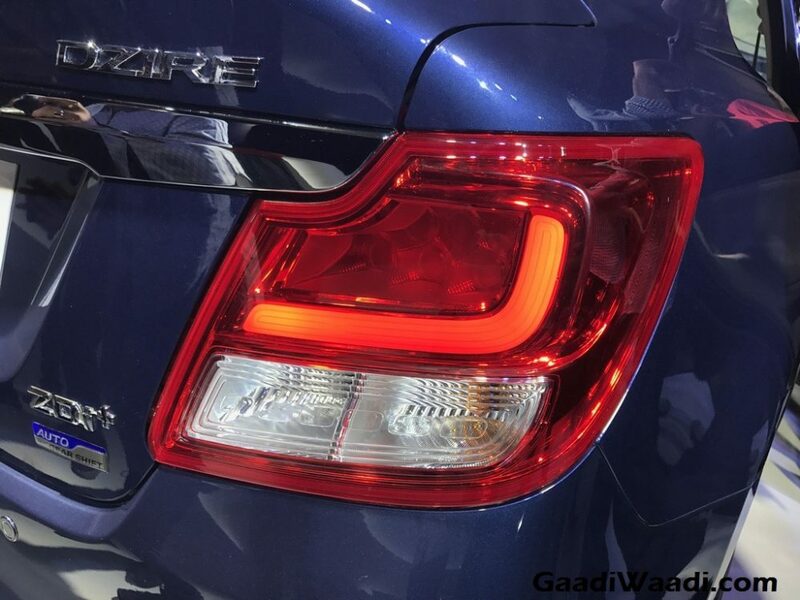 But the rear end will largely reminds the current version with minor tweaks that include LED lamps. 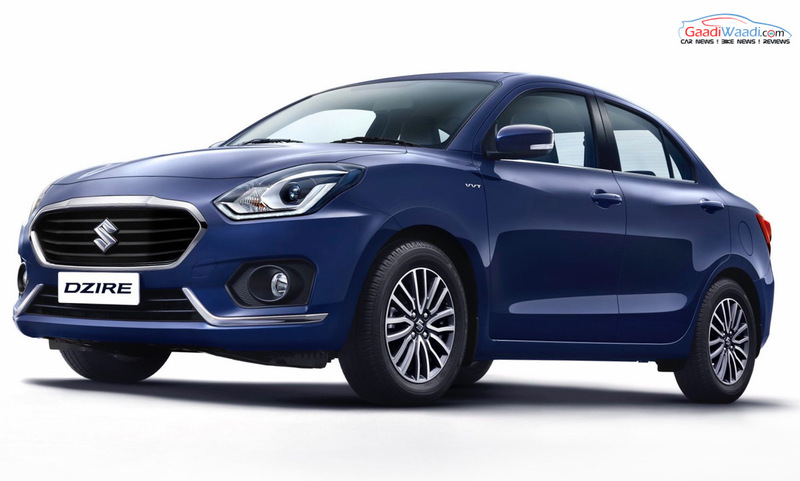 As the new Dzire is based on the fifth-generation B-platform, it has lowered kerb weight that could assist in improved handling. 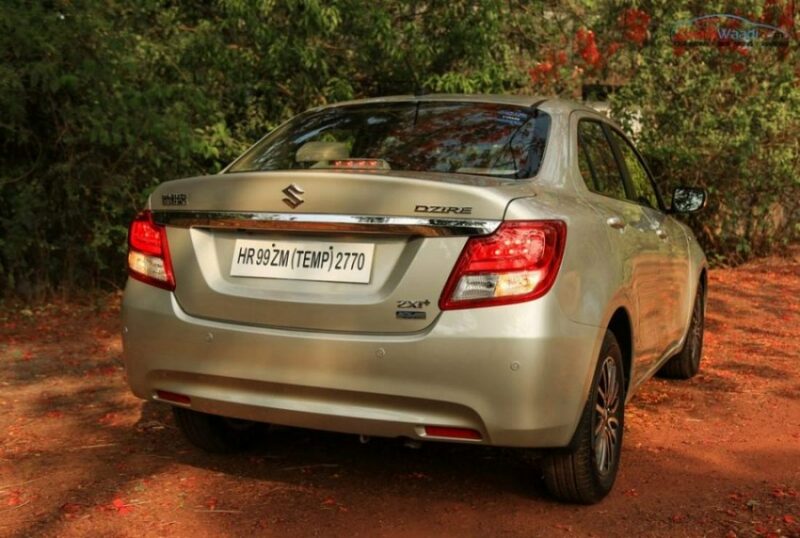 Due to the use of high tensile steel with increased rigidity and strength, the vehicle safety is improved along with performance, emission and fuel efficiency according to Maruti Suzuki. 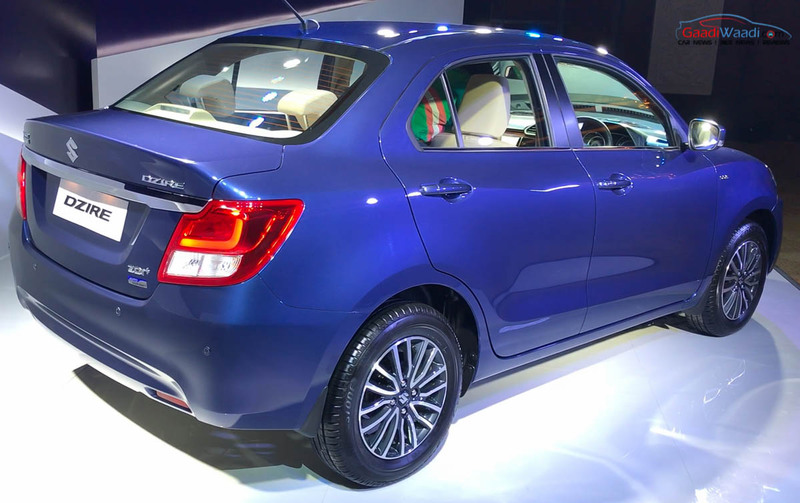 Since the new Dzire is based on the Baleno’s platform, the height is reduced by 40 mm while the wheelbase is increased by 20 mm. 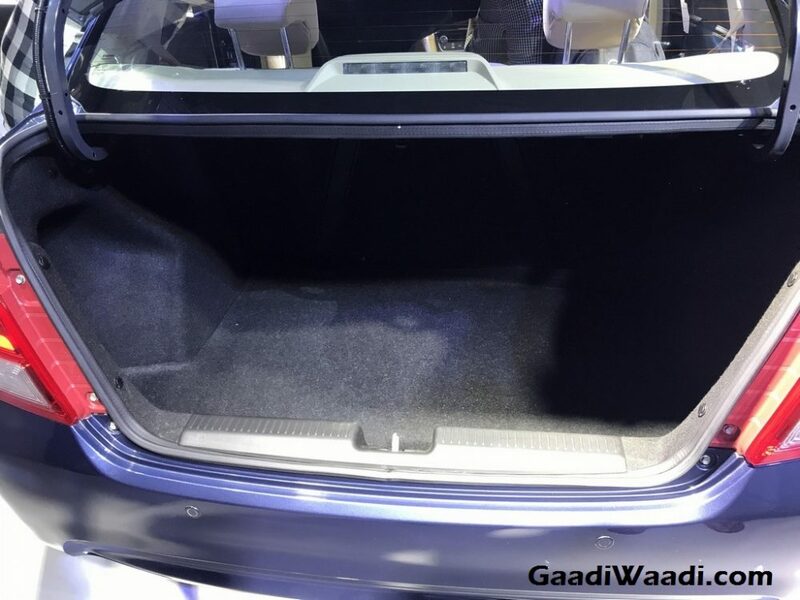 The width of the vehicle has gone up by 40 mm and it will translate into more cabin room as the shoulder room up front and rear goes up by 20 mm and 30 mm respectively. The fuel tank capacity has been reduced to 37 litres from 42 litres and the rear leg room has increased by 55 mm. 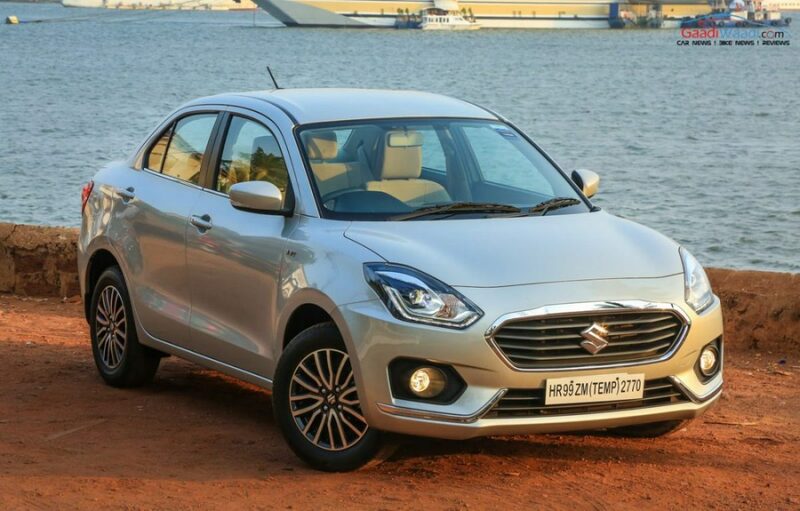 The petrol MT weighs at 860 kg and 895 kg for the petrol AMT version while the diesel MT tips the weighing scale at 955 kg and 990 kg for the AMT. 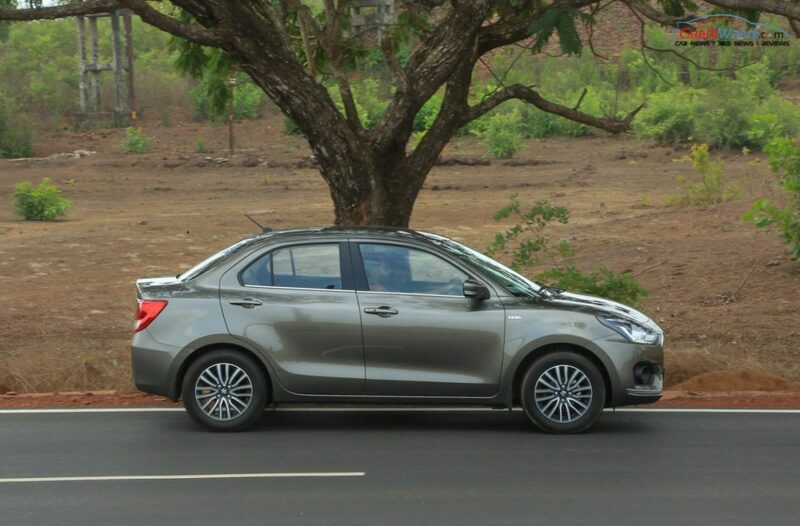 Due to the significantly lowered kerb weight, the handling and driving dynamics are said to have improved by a large amount. 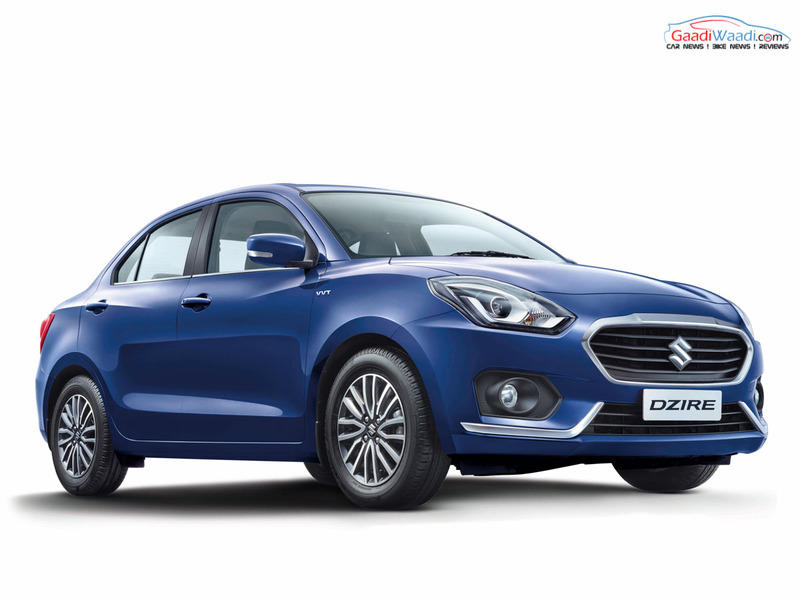 The ground clearance of the all-new Maruti Dzire sedan is 163 mm – 7 mm lower than the outgoing model for improved aerodynamic stability. 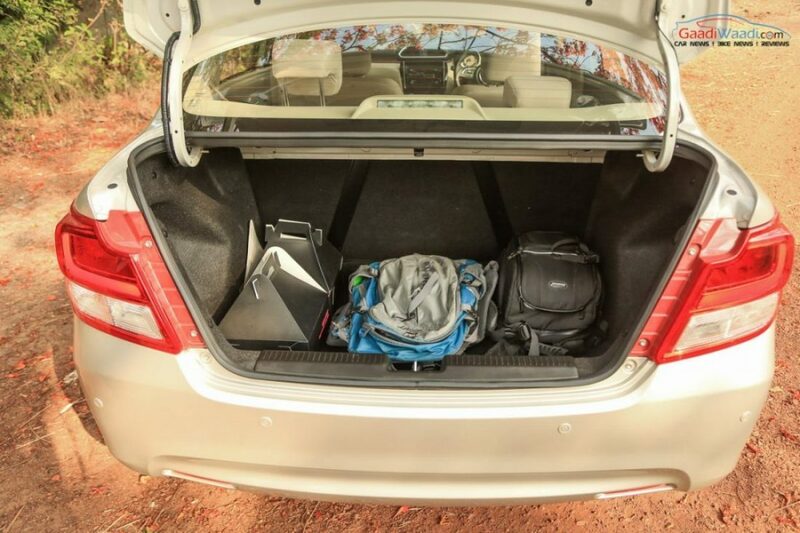 Due to the new lighter Baleno platform it is based on, the luggage compartment has seen increase in capacity as it is at 378 litres – 62 litres more than the existing model. 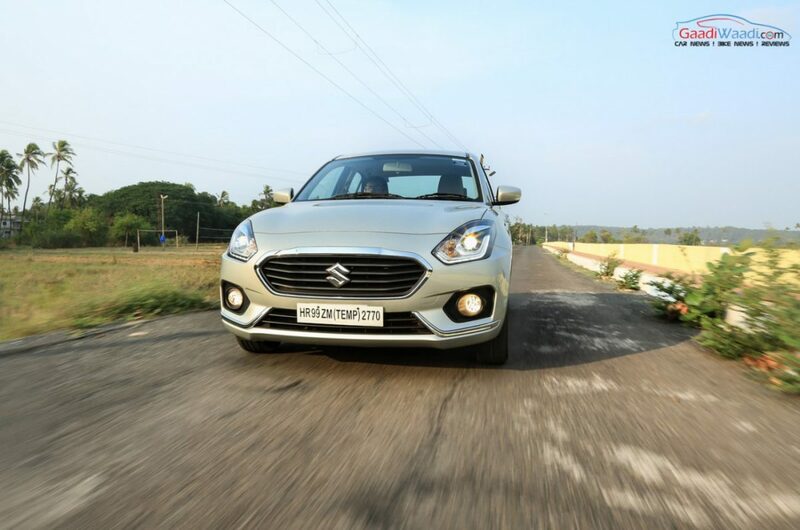 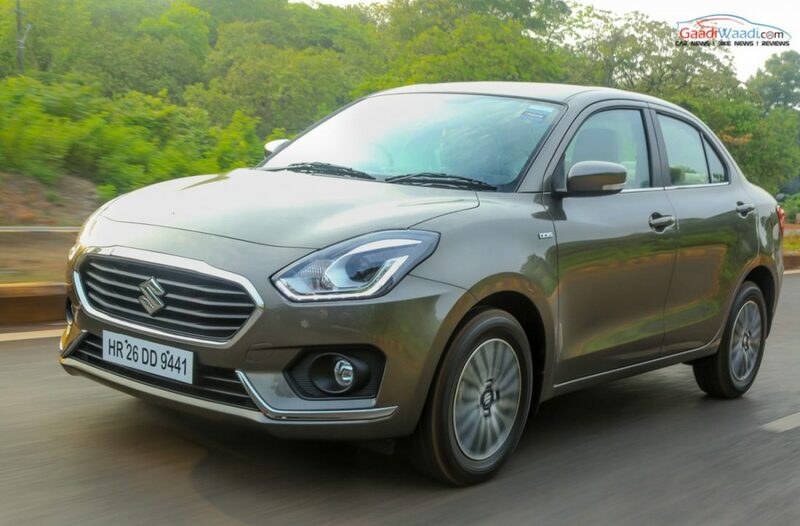 The new generation Swift Dzire comfortably rides on the regular wheel sizes as there are 14-inchers on the lower trims while the high-spec grades are subjected to larger 15-inch alloys. 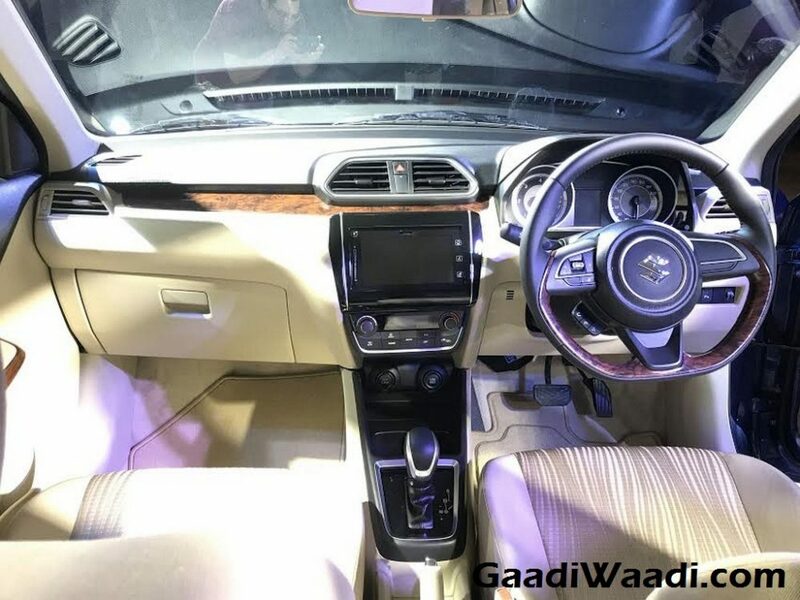 The interior has gained updates as well but it only borrows some design elements from the new generation Swift than we initially thought. 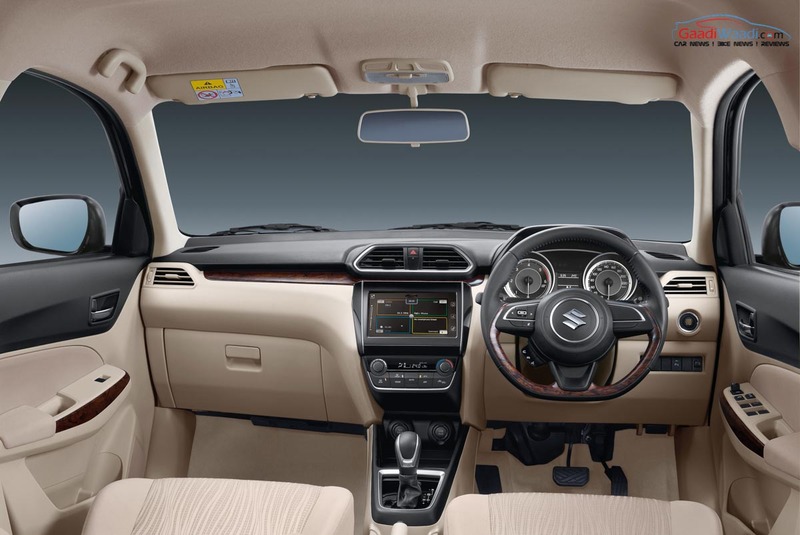 In short, the cabin and three-layered dashboard look completely different and unique and have certainly gone more premium that it currently is. 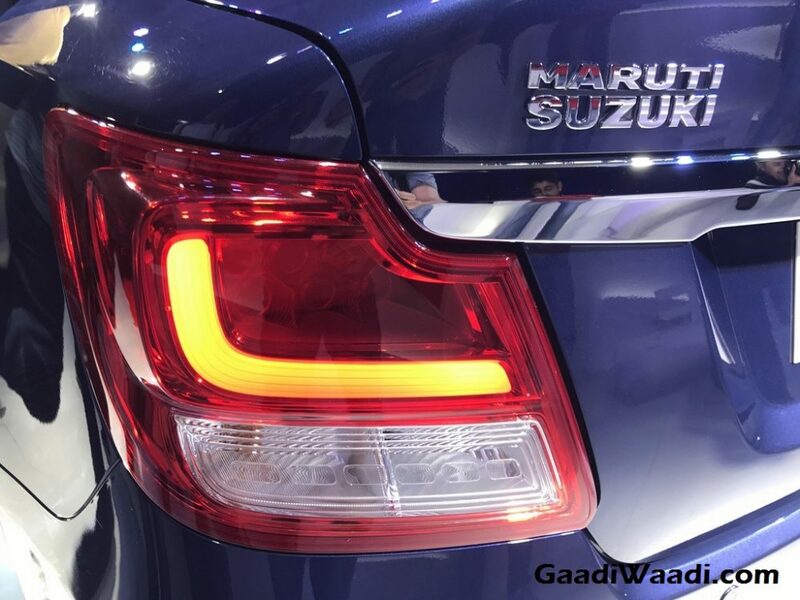 We expected to see equipment upgrade and added safety in response to the increasing competition but Maruti seems to have dished out something even more appealing and upmarket. The new Dzire dons a redesigned multi-function flat-bottom sporty steering wheel with mounted controls taken from the upcoming Swift, a dual-pod instrument cluster with new digital MID and the dashboard comes in new guise. 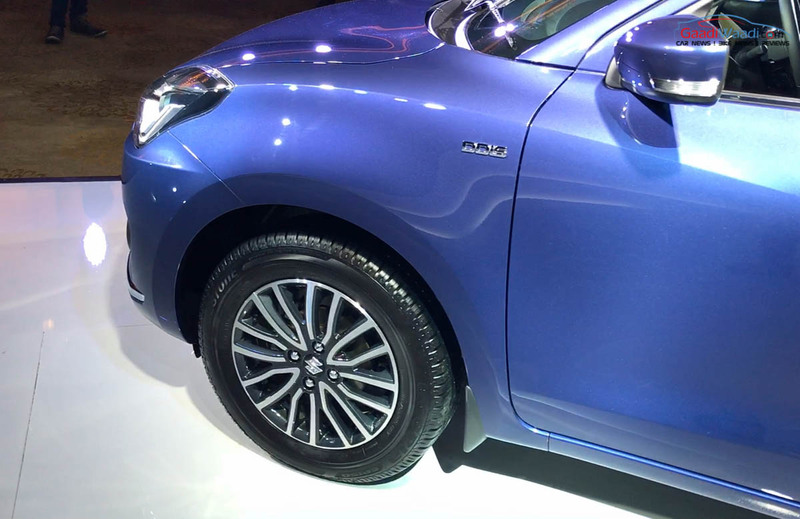 However, a round shaped HVAC vents seen on the new Swift has been used here and instead a conventional system greets the design. 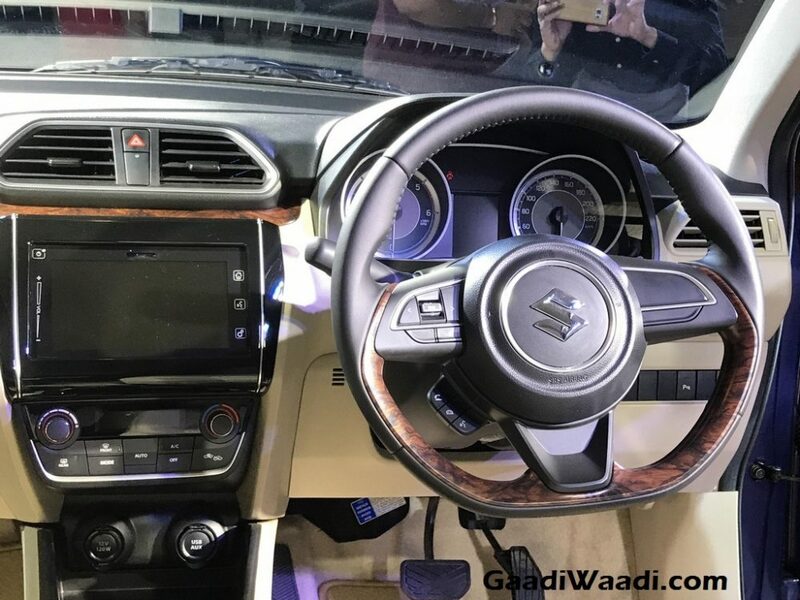 Underlining the bettered cabin quality, the steering wheel and lower dash seen here are finished in wooden while there will surely be more soft touch plastic trims on other areas. 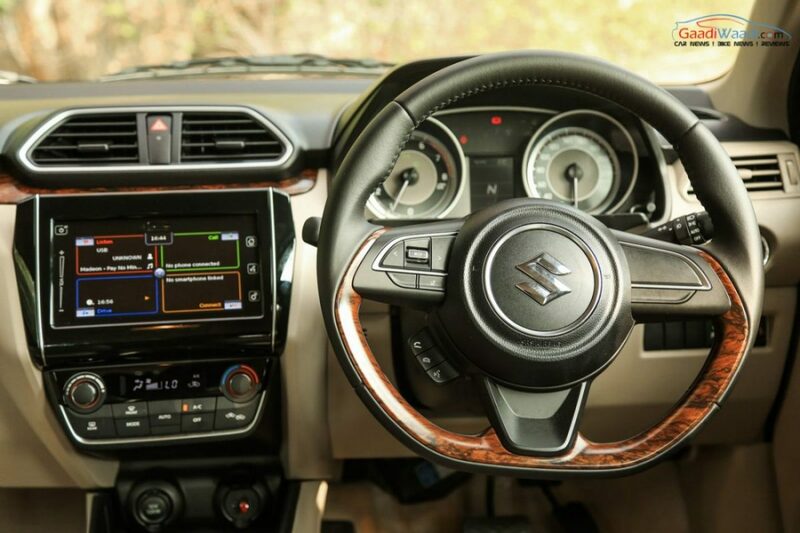 Also, a touchscreen Smartphone Linkage Display Audio (SLDA) system with Apple CarPlay, Android Auto and Mirror Link take the game up further for this car. 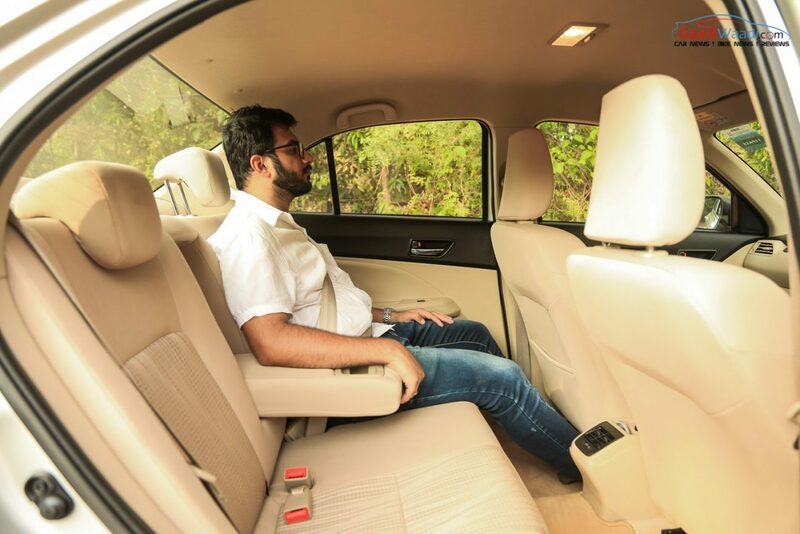 In terms of seats and upholstery, they will come wrapped in new upmarket material, while in terms of space inside cabin the upcoming car is likely to go through minor changes. The instrument panel, gear knob, steering, doors and speedo rings are accentuated in satin chrome. 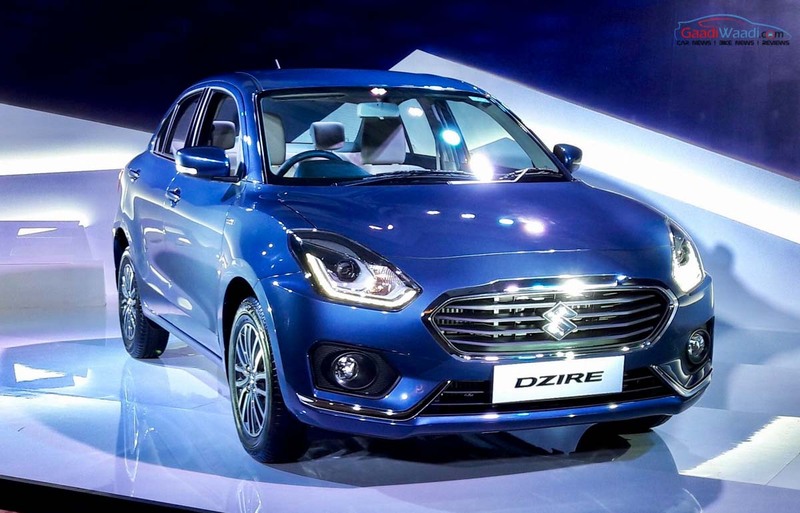 The new Dzire sedan will be offered in six different exterior paint schemes: Arctic White, Silky Silver, Oxford Blue, Sherwood Brown, Magma Gray and Gallant Red. 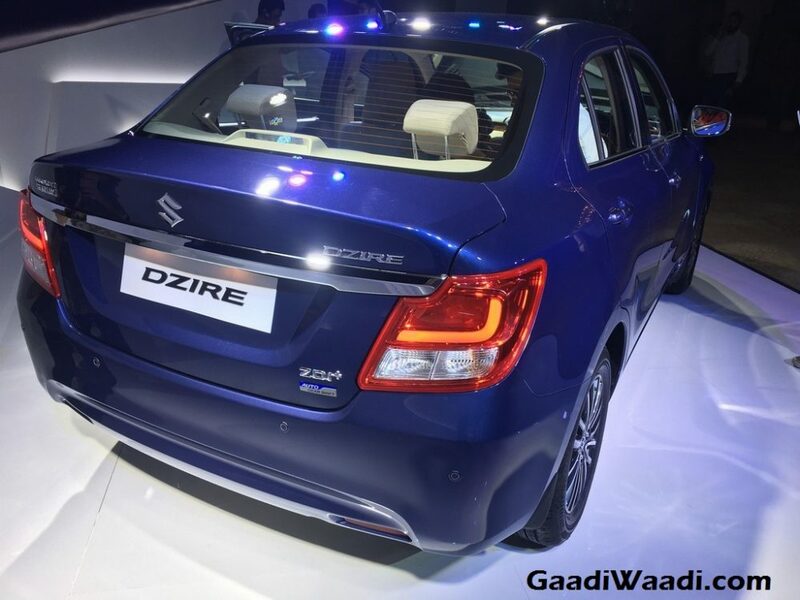 2017 Maruti Suzuki Swift Dzire will surely get updated safety features compared to the outgoing model. 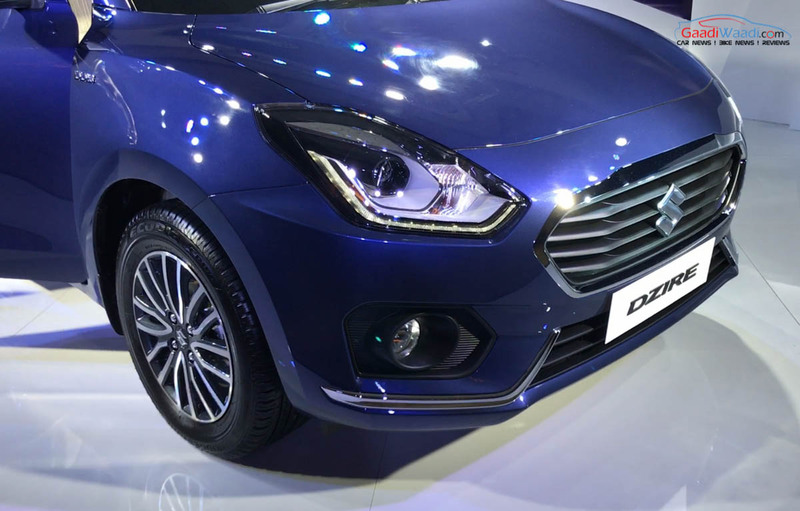 It will receive dual airbag with pre-tensioner, and ABS with EBD as standard across all variants. 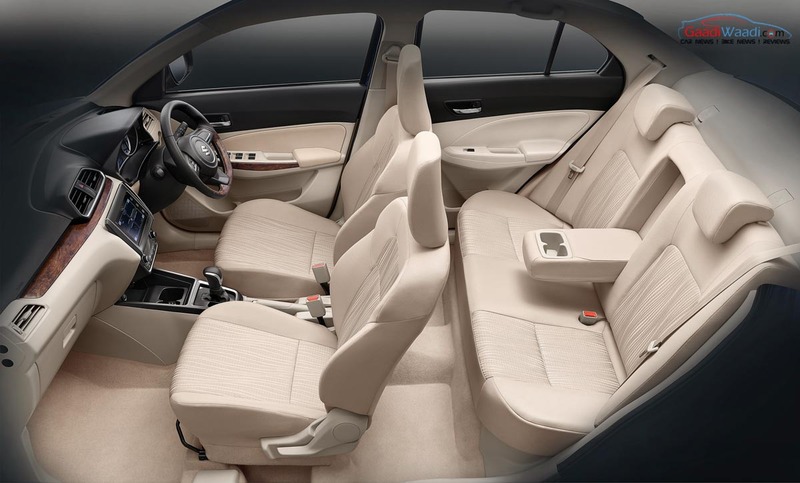 Accompanying them is the standardised ISOFIX child safety system while other safety features include reverse parking camera, engine immobiliser and door ajar warning light. 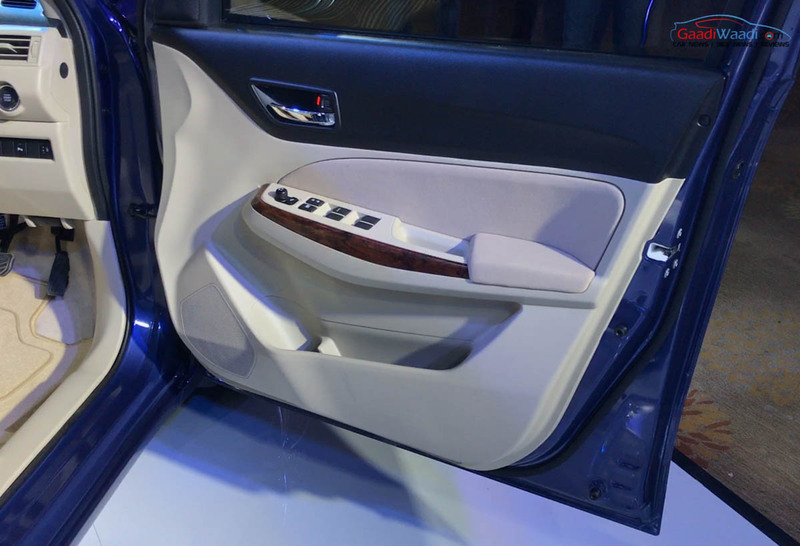 It is said to be in compliant with future front offset, side impact and pedestrian safety regulations. 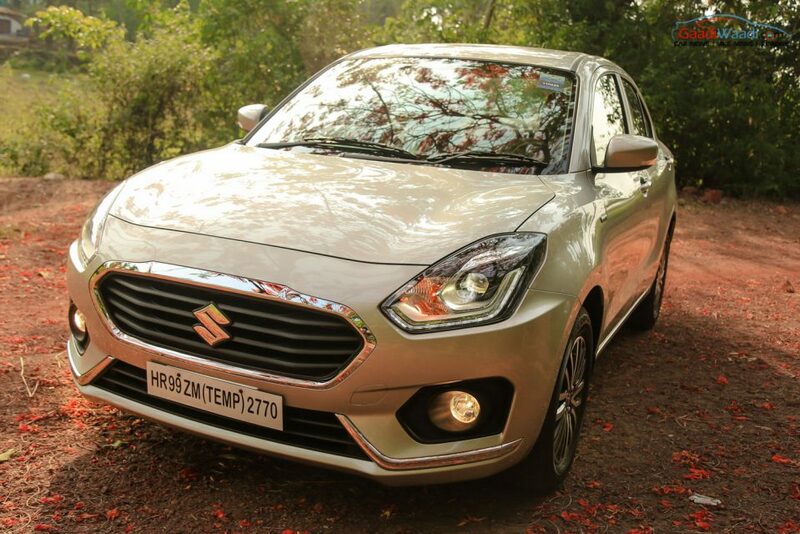 The 2017 Maruti Suzuki Swift Dzire will lock horn with rivals like Honda Amaze, Hyundai Xcent, Ford Aspire, Volkswagen Ameo, Tata Tigor, etc.